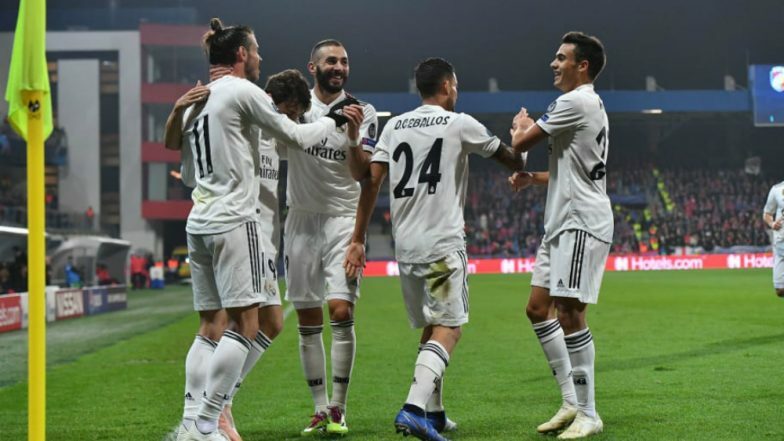 Real Madrid vs Eibar Live Streaming Online: How to Get Spanish La Liga 2018–19 Match Live Telecast on TV & Free Football Score Updates in Indian Time? Zinedine Zidane was given a reality check early in his second spell at Real Madrid as the Los Blancos lost to Valencia in the last game. The Frenchman would want his side to bounce back when they play Eibar at home. Eibar have put in some handy display this season that has put him within a win of a place in the top half od the table. They have already beaten the Merengues this season when they humiliated them 3-0 back in November and revenge will be on the minds of the Madrid players. Real Madrid vs Eibar - Live Football Score. Real Madrid will be without the services of full-back Marcelo who is suspended for the tie while keeper Thibault Courtois is out with an injury. Sergio Regulion will once again find himself in the starting eleven given the absence of Marcelo which was quite a common sight prior to Zidane’s arrival. The front three of Isco, Gareth Bale and Karim Benzema pick themselves in the team as there is hardly any competition for places up top due to the poor performance of squad players. Eibar coach Jose Mendilibar has plenty of selection problems with Pape Diop suspended and Anaitz Arbilla, Jordi Calavera and Pedro Bigas are out injured. Charles has scored 13 goals for Eibar this season and the veteran forward is his team’s leading goal-scorer. Sergi Enrich scored against Real Madrid the last time the clubs met and he will likely partner Charles in the attack. Pedro Leon will also have a point to prove when he visits his former club Madrid having scored against Rayo Vallecano in the previous match. Real Madrid have won seven out of the nine games played against Eibar and Zinedine Zidane has enough talent on the pitch to secure all three points. When is Real Madrid vs Eibar, La Liga 2018-19 Football Match Schedule (Date, Time and Venue Details)? Real Madrid and Eibar lock horns against each other in the La Liga match on April 06, 2019 on Saturday. The Real Madrid vs Eibar football match will be held at the Santiago Bernabeu. It will kick off at 19:45 PM IST. How to Watch Live Telecast of Real Madrid vs Eibar, La Liga 2018-19 Football Match? Sony Pictures Networks holds the broadcast rights of La Liga in India. So, the Real Madrid vs Eibar match will be live telecast on Sony Six and Sony Six HD channels. Where to Get Free Live Streaming Online of Real Madrid vs Eibar, La Liga 2018-19 Football Match? If you are unable to watch the match live on their TV sets, you can catch Barcelona vs Leganes match online via live streaming on Sony Liv app as well as on La Liga's official Facebook page. You can also live football score updates on LatestLY here.